Easy to grow and full of vitamins. Finely-flavored carrot does well as a bunching carrot and as a storage carrot. It grows 6-8" long and is practically coreless. We searched the world to find the best organic seed-Burpee fully guarantees that not a drop of synthetic chemicals was used to make these excellent seeds. Certified Organic. 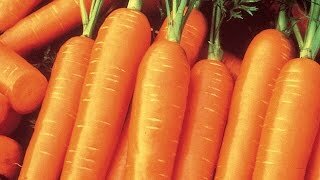 Carrot, Scarlet Nantes Organic is rated 3.7 out of 5 by 6. Rated 2 out of 5 by Anonymous_ from Not that great These weren't very sweet. I feel like they took up way too much room for what you get. I will not be growing these again. Rated 5 out of 5 by Jane49 from 100% germination I direct seeded on April 2017 and had 100% germination and I had a full crop and only pulled up as needed for cooking. These were very tasteful, my grandchildren loved them. Rated 4 out of 5 by Miss Vee from Easy for A First Timer! I planted these last spring as directed. A few days later something decided to dig up half the garden bed so I didn't think many would have taken. However, to my surprise, come harvesting time, I got quite a few bunches of delicious carrots! The majority were on the smaller/thinner side and a a few were a bit warped looking. However I think that was due to the fact the seeds were dug up and misplaced by whatever critter was in the garden. Either way they were easy to grow and tasted great. This was the first time I decided to try growing carrots and the first time I had ever planted anything by seed. I think I am going to try these again next season. I added a photo of the first harvest as well. Rated 5 out of 5 by JackieW from Super easy to grow! I planted these and they went nuts. I haven't had to do anything but water them. They are super sweet raw and cooked as well. 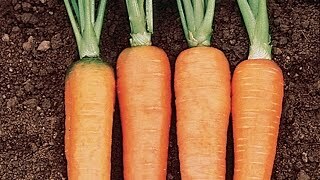 The easiest carrots I've ever grown. Rated 5 out of 5 by sunflowerlover from Outstanding! These carrots are doing great in my greenhouse in late November during very cold weather. Very easy to grow. All I had to do was water it! I would definitely recommend this carrot to anybody else.